Embedded vs. Perimeter CP Systems For Concrete | Matcor, Inc.
As with any engineering application, there are often many ways to approach a system design. This is especially true of cathodic protection system (CP system) designs for concrete structures. This technical bulletin details some of the design approaches. Mixed Metal Oxide (MMO) mesh anodes are a proven anode system commonly used in repair applications and on new vertical installations (columns, piles, etc…) or as an overlay.This system consists of either sheets or rolls of titanium wire mesh with a mixed metal oxide coating applied. The mesh is supplied in a variety of sizes (for example a 1” x 3” diamond pattern). 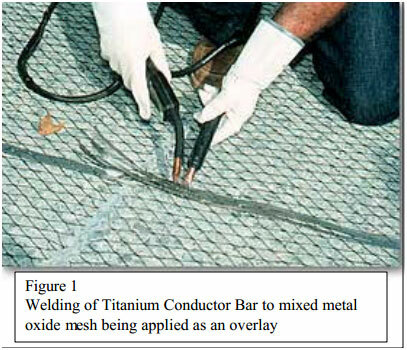 A series of titanium conductor bars/strips are welded regularly to the anode and are used to create the cathodic protection circuits (see Figure 1). For many atmospheric applications, a conductive coating system provides for a reliable and economic means of applying current to reinforcing steel. The conductive coating system utilizes discreet wire anode assemblies affixed to the structure and then the entire structure is coated with a conductive coating to distribute current evenly over the entire surface. A decorative top coat is then applied to the structure. This system is easy to install. 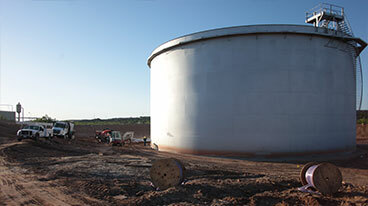 Surface preparation and choosing the appropriate application is critical. This system is not suitable for wetted or immersed structures. Unlike perimeter systems that are located on the outer edge of the foundation, embedded systems are located in relative close proximity to the rebar (see Figures 2 and 3). Any embedded anode system will require significant assembly to set up the anodes near the rebar and other structures.Another consideration is the potential for shorting during the pour and/or damage by rotary vibratory equipment used to settle the concrete during the pour. 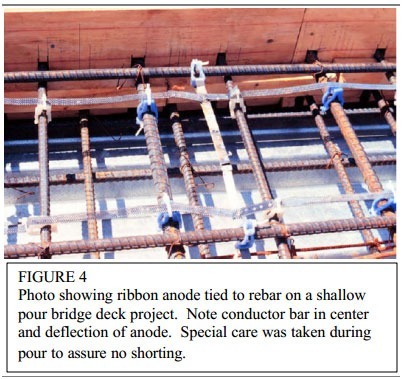 Electrical Shorting – The anode system must not become electrically shorted to the reinforcing steel or heating conduit at any time during the pour. This requires an anode that is both rigid and electrically isolated. The use of plastic “snow fence” material should be avoided. When “snow fencing” is used it does not provide sufficient isolation protection. Stopping the pour to reset anode(s) and/or clear anode shorts could have a serious affect on the concrete construction and could, in the worst case, result in a QA/QC problem requiring the structure to be scrapped and rebuilt. For any embedded type system, every effort must be made to design and install an anode system that is robust enough to require no further attention once it is set up for the concrete pour. Vibration– During the pour, vibration typically is necessary to remove entrained air consolidating the concrete and assuring good concrete distribution around rebar, internal piping and the anodes themselves. Any embedded anode system should be designed to allow for the use of pokers immersed in the concrete during the vibration process. There are two concerns during this stage of the concrete pour – first and foremost, we are concerned about damage to the anode system by the poker when it inevitably makes contact with the anode system. Secondly, we are concerned that the poker could inadvertently cause the anode to move and result in an anode short. MATCOR’s proprietary SPL™-HDP anode system is a product specifically designed for concrete applications and has a 20+ year history of successful application. 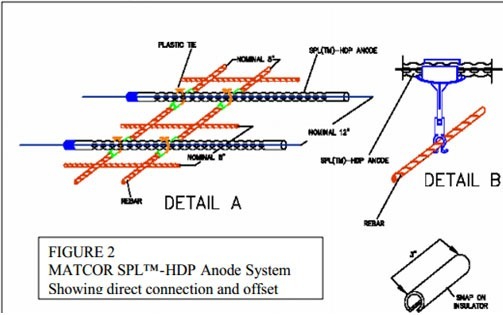 Unlike the continuous mesh or mesh/ribbon strip systems, the SPL™-HDP anode is not a bare anode but comes packaged in semi-rigid perforated high density polyethylene housing. 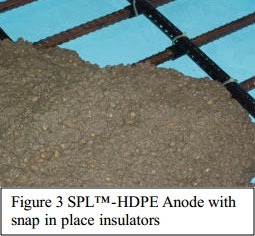 The anode is located inside the perforated housing and has its own self contained header cable.The SPL™-HDP anode can be laid out either on chairs or directly on the rebar mat or heating conduit with snap in spacers depending on the design requirements for good current distribution (see Figure 2). The perforations have been designed to allow the concrete to fill inside the pipe completely and ensure good contact with the anode. Because of the unique design of the anode system’s internal header cable, field connections are minimized and there is no need for titanium conductor bars and the associated field welding that continuous mesh or mesh/ribbon strip systems require. MATCOR’s SPL™-HDP system is packaged in anon-metallic housing that virtually eliminates concerns about direct shorts. Because the perforated high density polyethylene housing is semi-rigid and firmly supported every 8”-12”, it is significantly more robust than a bare anode based system. Concerns regarding the anode dislodging and shorting during the concrete pour are minimized. The anode is much less susceptible to damage with greater mechanical integrity than any bare anode system. This makes it the ideal choice for applications where the cathodic protection system is but one activity going on and where there will be plenty of other construction activities required in the same area greatly increasing the anode system’s susceptibility to being touched, moved, and otherwise abused both during the layout phase and during the concrete installation. This system is able to withstand being hit by pokers during the vibratory process. 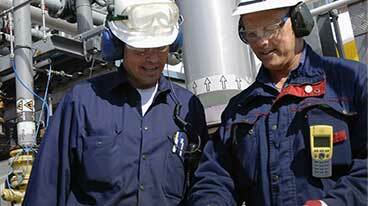 Because of its strength, MATCOR’s SPL™-HDP is the best system for an embedded anode application. Ribbon anodes are bare MMO anodes laid out in discreet strips. The strip can consist of dense mesh or solid ribbon. Several sizes and output ratings are available for these types of systems. The MMO strips are welded to titanium conductor bars to complete the cathodic protection circuit. For an embedded configuration, the continuous mesh anode system, a discreet mesh or ribbon strip system would require a minimum of two layers of anode. The anode for the lower mat of rebar would most likely have to be placed on plastic chairs (rebar clips)typically 1-2” above the rebar. Some consideration will have to be given as to how the heating conduits are to be secured in place to assure that there is no contention between the two support systems. For the upper mat, the anodes will either have to be suspended from the reinforcing steel or sit on chairs above the heating conduit. The anode strips will require frequent welding to a series of titanium conductor bars/strips as can be seen in Figure 4. The mesh or ribbon strip systems, as bare anode type systems, must remain isolated from the rebar or heating conduit system. During the pouring operation, special care must betaken to assure that the anode assembly does not move, sag, deflect or in any other way come in contact with the reinforcing steel structure. Technicians will have to be on hand during the entire pour with multi-meters and gator clips to assure isolation between the anode assemblies and the reinforcing steel.Should isolation be lost and the anode assembly short to the steel, the pour would have to be stopped and the short cleared manually before proceeding. This may be a rather difficult task and a severe hindrance to the construction process. Mesh or ribbon strip systems are bare anode systems with no mechanical protection from damage during setup and installation. The anode is highly susceptible to damage from an oscillating poker used during vibration.